In a TV interview opposition challenger says he is determined to bring an end to president’s “dictatorship” but he doesn’t have the support of everybody involved. 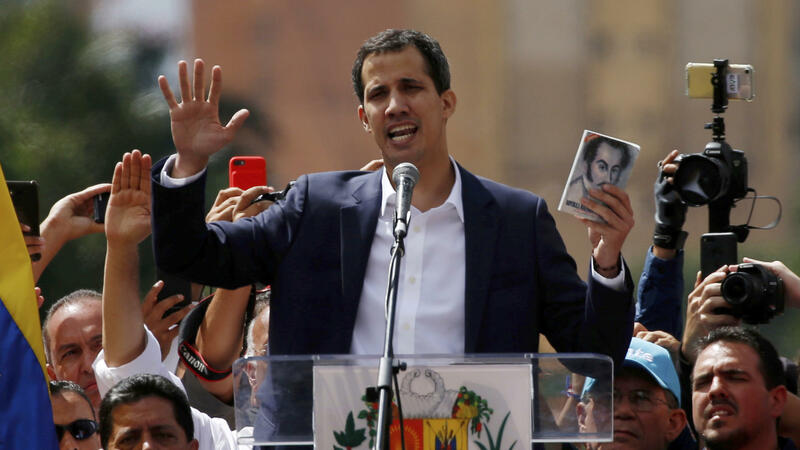 In a high-stakes political gamble, Guaidó on Wednesday declared himself Venezuela’s legitimate interim president and was quickly recognised as such by powers including the United States, Brazil, Canada and Colombia. Western nations are calling Maduro’s presidency unconstitutional and fraudulent. But the opposition leader faces an uphill battle, as he does not have control over vital state institutions and armed forces have disclaimed him. Military commanders have so far promised to stick with socialist Maduro. Jeremy Hunt, the British foreign secretary, has said that his government believed Guaidó was “the right person to take Venezuela forward” but China, Bolivia, Cuba, Russia, Iran, Syria and Turkey all backed Maduro, who claims he is the victim of a coup attempt masterminded by the US. The US state department, on the other hand, has suggested the US citizens to “strongly consider” leaving Venezuela and ordered out non-emergency government staff. During his first interview, Guaidó said he was determined to bring Maduro’s “dictatorship” to an end, stabilise his economically devastated nation and organise free elections as soon as he can. The 35-year-old opposition leader renewed his call for Venezuela’s military – whose members have been offered an amnesty if they turned on their commander-in-chief. He also stated that even Maduro himself could be offered an amnesty if he agreed to step aside. Maduro, who has vowed to resist what he calls a “gringo” plot to unseat him, hasn’t yet given any hints on his decision. He addressed the supreme court in Caracas on insisting that he is ready for dialogue, understanding, negotiation and agreement. It’s still unclear as to whether Maduro will now move against Guaido. The U.S. is making it clear that there could be a very strong response from them if he does so. The White House is saying no options are being ruled out. Maduro is being publicly defiant. But I think his future might depend now on whether he can maintain the support of the military.